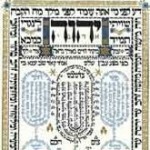 Q. I read that the name HaShem represents the God of Love and the name Elokim is the God of Power. Which is the correct version that should be used? A. They are correctives of each other. God’s power is tempered by His love and His love is disciplined by His power. The Zohar says that it is only from the limited human perspective that He seems to have contradictory attributes. If we were able to perceive Him more clearly and correctly we would realise that all His attributes live together in harmony. This entry is filed under Ask The Rabbi, God. WordPress generated this page with 31 queries, in 0.219 seconds.